For excellent slot games online you have come to the right place! 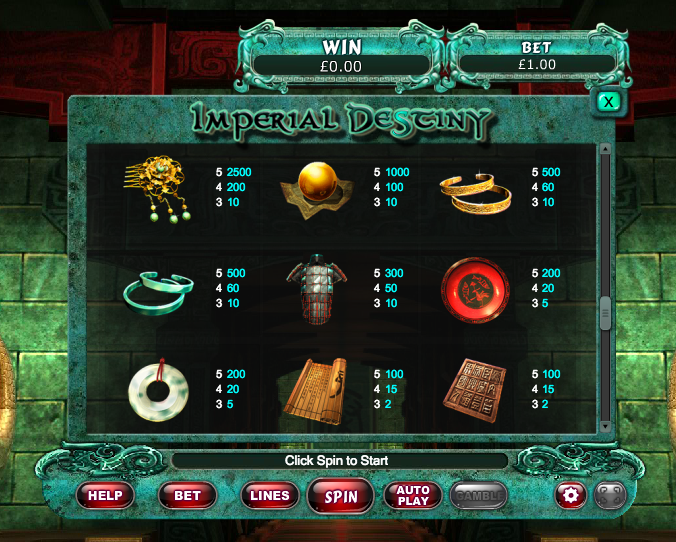 Achieve your imperial destiny by locating the hidden tombs of ancient China in this uk slots online 5 reel. Are you brave enough to overcome the dynastic rule of the far-east and earn yourself some of the many bonuses that this game has on offer, Play now! Consistency and reliability are always what you can expect with Eyecon and Imperial Destiny is no exception to this rule. Eyecon has already solidified a strong reputation within the Casino community after successful titles such as ‘Fluffy Favourites’ and ‘Shaman’s Dream.’ Sound familiar? They are also well known for their passion and determination to deliver a fully functional mobile gaming platform, meaning that players can play on the go. 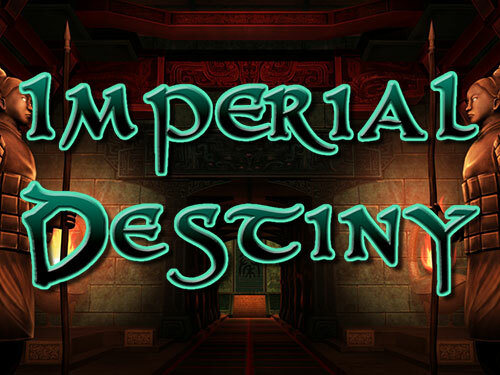 This developer now brings you a historical theme, dating back to 220BC, following a ruthless Chinese Emperor. This theme already rings different to your typical casino game but embrace the difference and we promise you will not be disappointed. Learn more about how to pay by mobile. 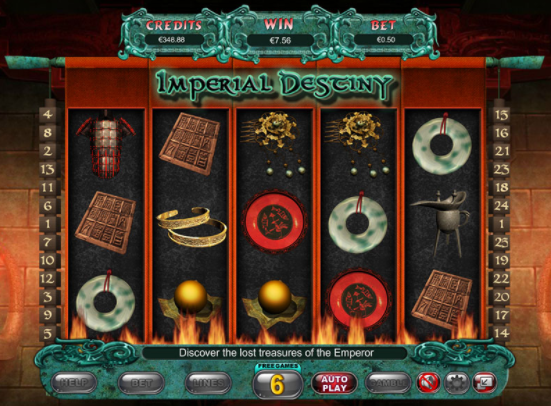 Do not expect to be able to stand down in this slot-game, as Imperial Destiny slings you right into the front line. Eyecon creates impressive visuals as you truly get a feel for the settings that existed in historic China. This is the perfect opportunity for those history enthusiasts to experience the feuds and struggles that came naturally to warfare and imperialism. The slot-game is set up as a 5 reel, 25 pay-line slot with 3 main rows to play around with. Spins start from just 1p with a max of £12.50 and to add to this when you match 3 or more Warrior symbols the game offers a ravaging treasure prize of possibly receiving up to 100x your stake! The wild symbol is what you want to keep your eyes peeled for. The Emperor represents this, and he aids you by substituting all symbols apart from the warrior and emperor, to allow you to accumulate winning combinations to boost your overall cash prize. There are also two bonus features to enjoy in this medieval themed new slot games. There is the Free Spins mini-game which is activated by collecting 3 scatters, which is the Bell symbol. By collecting 3 of these, you will receive 15 free spins, 4 will assure you of 20 free games and 5 will reward you with 25! A note to make here is that the Wild emperor will only appear on reels 1, 3 and 5 during the free spins, so although this limits your chances for the wild, having more games means you are not having to pay for another spin and instead, you can continue to win the big money! If you’re feeling brave to stand up against the emperor, you also can gamble your latest win. This makes it the most exciting feature of the entire game as can double your current winnings. With the minimum bet starting at just 1p, there really is no excuse to recruit yourself to be a part of the Emperor’s army and find yourself immersed in the world of ancient China in the hopes of coming away with more than just a scar to tell of your war stories! What are you waiting for? Play easy slots game now.